Jeff Rubin was the Chief Economist at CIBC World Markets for over 20 years. What we hoped seems to be coming true: At the same time as the IPCC (Intergovernmental Panel on Climate Change) predicts that we can continue to burn carbon at the rate we’re doing it now, for 27 more years before we raise the global temperature by 2 degrees, Rubin points out that the precipitous drop in the price of oil has given humankind a natural incentive to adapt. It’s nature’s way of telling thickheaded humanity that the carbon-burning age is over, it’s time to advance to the next stage-the green economy, green power. 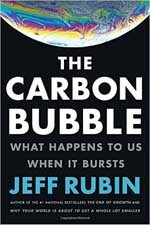 As a banker Rubin advises people that green investment is replacing coal and oil investment. Rubin also tells us that a Canadian, Dr. Abraham Gesner, first developed a process for producing kerosene from crude oil. Up until then it was used for tar pitch to pave roads. The first oil well drilled in North America was drilled in SW Ontario, in Oil Springs, Ont, a year before (1858) Col Drake drilled his well in Titusville, Penn. “Canada’s tar sands (the Alberta government spent millions of dollars in a PR campaign to change the name from “tar sands” to “oil sands”) are one of the most emission-intensive and costly sources of oil in the world.” At $100 a barrel, the oil sands are a huge untapped reserve, at $20 a barrel, they’re not worth the bother. USA and European oil consumption is falling. The recent Paris Conference emphasized that we must switch to renewables from carbon–burning based technologies. Rubin was one of the first unapologetic public figures to call Canada’s insistence on tar sands development, “Dutch Disease”. This naming of Canada’s economic dependence on oil was laughed off by the Harper Conservatives when Dalton McGuinty and Thomas Mulcair mentioned it but it proved to be true. Dutch disease, not to be confused with the disease which is killing elm trees, is the unintended pushing up of the value of the Dutch gilder in the 70’s when Holland discovered it possessed a hitherto unknown supply of offshore natural gas. The rising value of the gilder rendered huge swaths of the country’s manufacturing sector uncompetitive. In order to transport bitumen from the tar sands of Alberta to the east coast so that it can be exported or refined, the bitumen (with the consistency of a hockey puck) must be diluted to flow through a pipeline or to be loaded onto rail cars. The company, Enbridge, in this case, has offered to build a pipeline for the purpose which it will finance by charging the captive residents of Ontario exorbitant prices for its natural gas. Since the US president has rejected a pipeline, the alternative is to transport the bitumen by train. Coincidentally, the fourth richest man in the world, Warren Buffet, just bought the Burlington Northern Santa Fe railway for $34 billion, a freight railroad network which owns over five thousand kilometres of track across the western two-thirds of the US. In a related purchase the year before, he bought Union Tank Car in the US and Procor Ltd. in Canada, the companies which manufacture the DOT-111 tanker cars used to haul oil from booming shale plays like the Bakken in North Dakota and Montana to refineries in New Jersey, Pennsylvania and New Brunswick. In the early 1950s Donald Baker, a planning engineer in the Los Angeles Department of Water and Power, visualized a huge water diversion which would solve the Californian irrigation-drought problems. It was based on a plan which would redirect the water flow of Alaska, the Yukon and British Columbia into huge reservoirs. Environmentalists on both sides of the border were horrified by what implementing the plan would do to the watersheds of the Pacific Northwest. Thankfully, the scheme was too expensive and never got off the ground. The Prime Minister of Canada at the time, Lester Pearson, as well as the Secretary of State, Dean Rusk, were both enamoured of the plan. In 2008, Peter Lougheed, the former premier of Alberta, told the Globe and Mail, “With climate change and growing needs, Canadians will need all the fresh water we can conserve, particularly in the western provinces…I hope when the time comes, Canada will be ready. The reality is that fresh water is more valuable than crude oil”. The oil sands used 170 million cubic metres of water in 2011, an amount equivalent to the yearly domestic water usage of 1.7 million Canadians. This book touches on the important points which we are all thinking about. Even those of us who deny the reality of climate change must finally face the facts that put tar sands extraction firmly in the territory of financial impossibility, impracticality. As Canada’s temperatures rise, more and more fertile soil combines with longer and longer growing seasons to produce bigger and bigger crops of corn, soy beans, wheat and even wine grapes. At the same time former arable land will become less productive as prolonged droughts and less precipitation result in the loss of moisture in the topsoil. Canada’s rising temperatures will eventually make it into one of the earth’s breadbaskets. Temperatures in the High Arctic are the highest they’ve been in 40,000 years and possibly, in 120,000 years. In just the past 50 years, temperatures have risen 4 degrees in the Canadian Artic. A ship sailed from Dalian, China to Rotterdam, using the Northern Sea Route (as the Northwest Passage is known in Russia), shaving off 24,000 nautical miles with attendant fuel savings and shortening the trip from 48 days to 35. A month later the ship, Nordic Orion, sailed from BC to Finland through the Northwest Passage, saving 4 days and 1,000 km with attendant fuel savings. The Carbon Bubble states clearly that Canada’s economic future will be found in hydropower, which we possess in abundance, food production, with arable land extending further north as the planet warms up and shipping goods through the Northwest Passage.